The second International Conference on Machine Intelligence (ACIDCA-ICMI'2005) is organized by the REsearch Group on Intelligent Machines ( National Engineering School of Sfax - University of Sfax ).  ACIDCA-ICMI'2005 will be held under special circumstances in the hospitable country Tunisia . It will be held in the second part of the United Nations sponsored World Summit on the Information Society circumstances, which will take place in Tunisia in November 16-18, 2005. Tunisia proposed the idea of the Summit in 1998 at the International Telecommunication Union annual meeting in Minneapolis, USA in which the digital divide between developed countries and developing countries was considered to be a major challenge for the World Community. The first part was held in Switzerland in 2003. The venue for the ACIDCA-ICMI'2005 Conference will be Tozeur , Tunisia. Tozeur a prosperous town, was once, in its oases and mountains, one of the Roman outposts named “Thusuros” and a stopping point for the caravans coming from the sub Sahara to trade with the coastal cities of the Mediterranean, it now owes its fame and affluence to the stately palm and its world renowned dates - deglet nour "fingers of light". The conference will be held November 5-7, 2005 in Tozeur in south-western Tunisia accessible by the international airport of Tozeur. The remarkable architecture of Tozeur, beige sun baked bricks set in geometric patterns, Moorish arches and high vaulted ceilings and the shops offering locally woven carpets, Berber jewellery and ornaments, promise visitors another aspect of Tunisia.